These four cantatas all come from the first year of Bach’s time in Leipzig, during which he had just started working hard on the ‘well-regulated church music’ project that would produce five complete annual cycles of church cantatas in as many years. Not surprisingly, the 1723-24 cycle is a diverse one, but the centrality of chorale melody is a constant here: No 73’s opening chorus uses its chorale’s first four notes as a motto, then intersperses choral renditions of its individual lines with bursts of recitative; No 44 has it halfway through as a simple tenor solo over the continuo’s agile tread; and No 109 closes with a rolling chorale prelude-style setting for choir and orchestra. Most touchingly, No 48 overlays its opening chorus, wearily pondering the question ‘who shall deliver me from this body of death?’, with a wordless answer: trumpet and oboe intoning a chorale melody associated with the text ‘Ah, Lord, forgive me yet’. It is a subtle touch that most of us will have needed Christoph Wolff’s booklet-note to point out. 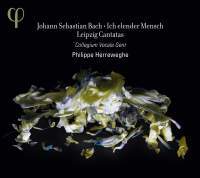 But its quiet reassurance for those with the faith – religious, musical or both – to listen is a perfect example of why one should never write off a release like this as just another disc of Bach cantatas. Not that Philippe Herreweghe is a conductor to hammer these things out. His is a wisdom that looks to let the music speak by its sheer sonic and intellectual beauty, and his ear and mind enable him to achieve that aim with unerring grace, humility and skill. With his superb 12-strong choir matched by an orchestra of deep but unfussy expertise, he produces a purring model of modern-day Bach performance. His four like-minded soloists, familiar from his other recent Bach recordings, gather for the final track, a strophic ‘aria’ affectingly alternating duple and triple metres by Bach’s Leipzig predecessor-but-one, Johann Schelle.